The Atlantis Resorts are the perfect base for an amazing diving retreat in the Philippines as you can combine two diving spots into one holiday! Why not combine the exhilarating thresher shark diving at the wonderful Exotic Dive Resort in Malapascua with a week at the beautiful Sangat Island Resort exploring the 11 wrecks. A Philippines archipelago home to rugged steep limestone rocks, white sandy beaches and rich turquoise waters creating amazing sceneries. The Atlantis Azores is a luxury 33 metre boat allowing you to experience the finest diving in the Philippines by offering 4 route options including Bohol, Malapascua, Cebu and Tubbataha Reef. Exotic Dive & Beach Resort is the perfect hotel with a variety of rooms, a magnificent beachfront location, out of this world thresher shark diving experiences and a unique man-made house reef. This boutique hotel is located on the island of Palawan, a nature sanctuary known worldwide for its ecological diversity and stunning physical features. The Blue Star Dive Resort is the ideal base where you can dive, explore, relax and have the most remarkable experience in the Philippines with year round warm crystal clear waters and natural reefs. The resort is ideally located in the Mabini-Tingloy Pensinsula to the north of Puerto Galera and to the west of Verde Island where you will find great wall dives, sea mounds and coral gardens. The Philippine Siren is takes 10 night trips to the more remote diving locations not easily accessible from resorts. With a choice of seasonal itineraries and a good full board basis you will not be disappointed one bit. The beautiful and intimate resort, El Rio Y Mar is located on a picture perfect white sandy beach surrounded by crystal clear blue waters filled with an abundance of marine life! Perfection! Club Paradise is set on the beautiful Dimakya Island amidst sparkling turquoise waters filled with delights such as dugongs, green turtles and the Japanese freighter Kyokuzan Maru wreck. Magic Island Dive Resort is an intimate retreat ideally located on a small coastal area with breath-taking views and a fantastic house reef enriched with an abundance of marine life to enjoy. Opening in July 2015, the Magic Oceans Dive Resort is located on the east coast of the fantastic green and quiet island of Bohol in the Visayas region boosting one of the most amazing house reefs. Located at the end of Mabini, Buceo is the only resort in Anilao that has a sandy beach and is surrounded by a reef full of marine life for guests to take full advantage of. This is a conveniently located Hotel and Casino, only 1 minute from the airport with comfortable rooms and access to superb facilities. This hotel is ideally situated near the airport and has many entertainment opportunities on offer, both within the hotel and the surrounding area. Explore the Philippines’ game reserve and wildlife sanctuary in Calauit Safari Park, a 3,700 hectare island off the coast of Palawan. Spend time with friends or a loved one on a beautiful uninhabited island. Take a pick from 3 romantic island destinations. Each has its own kind of enchantment, yet with the same romantic ambiance. Definitely not to be missed! Experience the precious ecosystems, sheer beauty and tranquility of one of the world’s great natural playgrounds, Palawan. Discover three uniquely beautiful private islands perfect for true connoisseurs of indulgently laid back escape. Be enchanted by the beauty of the picturesque Kayangan Lake or take a dip at the invigorating Maquinit Hot Springs as our whole day tour brings you to Coron Town and Coron Island. Manila + Banaue + Bicol. Manila, also known as the Pearl of the Orient, the largest of the three and the capital city of the Philippines. Banaue is the gateway to the UNESCO World Heritage listed Ifugao rice terraces of Northern Luzon. Finally on the trip, you will visit Bicol Peninsula at the Southeastern end of Luzon island. Apo Island is approximately a one hour boat ride from Atlantis Dumaguete and is a “Signature” dive site in the Philippines. A once in a lifetime, amazing opportunity for close encounters with these gentle giants. A non-stock , non-profit, non-governmental organization created for tarsier conservation. If you are coming to Puerto Galera or White Beach in Oriental Mindoro, visiting Extreme Sports Philippines is a must do thing in Puerto Galera. Our Adventure Park in Sto Nino is a one-stop for all adrenaline junkies! We are offering a wide variety of exciting activities and adventures to keep visitors of all ages entertained all day long. A beach walk to the lighthouse and enjoy the stunning beach views. Trio of picturesque waterfalls into natural swimming pools & lagoons, accessible via jungle trails. The Chocolate Hills of Bohol are spread over an area covering the towns of Sagbayan, Batuan, Carmen, Bilar, Sierra Bullones and Valencia. The famed Chocolate Hills of Bohol are more than 1,268 cone-shaped hills - a strange geological formation. The hills are spread over an area of 50 square kilometers or more and vary in size from 30 to 120 meters in height. The island province of Palawan is one of the most diverse and captivating in the Philippines archipelago home to rugged steep limestone rocks, white sandy beaches and rich turquoise waters creating amazing sceneries. This central region of the Philippines is famous for its diverse diving adventures on stunning and thriving dive sites along with beautiful beaches and a relaxed lifestyle. Mindoro is a popular diving destination for divers arriving in Manila as it only takes 3 hours by car and boat offering some of the best diving in the Philippines with sites like Apo Reef and Verde Island at your fingertips. 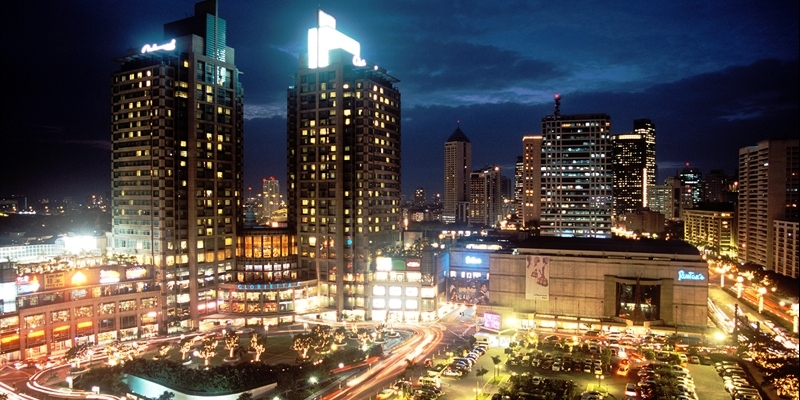 While in Manila you can choose from shopping malls and historic sites such as museums and memorials. Heading outside the bustling city of Manila along the Luzon coast you will find serene beaches, unexplored jungles, volcanos and many small villages. Without a doubt one of the best value destinations we offer. You can choose between 6 different locations each providing a different above and under water experience. 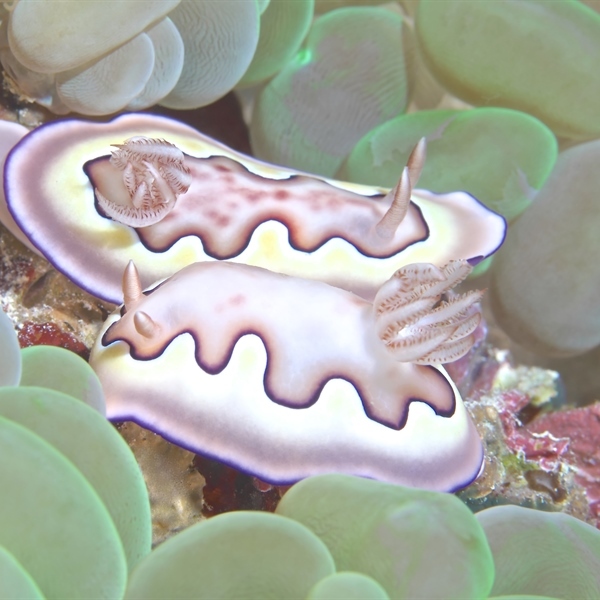 The diversity of islands is reflected underwater by the presence of the vastly diverse marine live and diving opportunities in the Philippines. Dive with dugongs at Dimakya Island, get up close and personal with thresher sharks in Malapascua or be in the midst of the fluoro diving or dancing sardines in Moalboal, the choice is yours! For wreck enthusiasts, Coron is the place to be as the waters around the islands are encrusted with Japanese WWII wrecks, a diving opportunity not to be missed. With a tropical climate, warm water, long and white sandy beaches, nearly 15,500 square miles of coral reefs, mind-blowingly beautiful flora and fauna, the Philippines is truly a diver's paradise. 13 nights at te Magic Oceans Dive Resort. The Philippines is an archipelago of 7,107 islands, 2,000 of which are inhabited. This beautiful land is covered with tropical stunning rainforests, caves, waterfalls, gorgeous beaches, pristine reefs and a diverse marine eco system. The Philippines is the second-largest archipelago in the world and one of the greatest treasures of Southeast Asia. The archipelago is a string of coral-fringed islands divided into three groups, Luzon to the north, the Visayas in the centre and the islands of Mindanao to the south strewing across a vast expanse of the western Pacific. The best diving areas are found in Luzon and the Visayas where below sea level, the waters boast some of the world's best diving and snorkeling at the very heart of the “Coral Triangle”. Dive sites in the Philippines are exciting and varied. In these waters you will find the best of the very best of the world’s biodiversity and discover animals of all shapes and sizes. The reefs have the widest variety of fish and corals in the world and you can also dive UNESCO World Heritage Sites like the outstanding Tubbataha Reefs with great pelagic action. The Canyons in Puerto Galera is the most famous dive site, a must visit for all experienced and technical divers. It is here that the currents encourage the abundance of marine life in the area making a massive impact. When currents are strong, the marine life is plentiful and varied. Burly surges along the wall which means divers and fish alike have to seek shelter in one of the three distinct canyons. You will find yourself having a short rest in each canyon surrounded by schools of snappers, jacks, sweetlips, emperor angelfish and barracuda. Recently, there have been sightings of pelagics including mantas, thresher and hammerhead sharks. Resting at the end of this site is a coral encrusted anchor, all that remains of a Spanish Galleon. The Canyons is best dived on nitrox to give you more bottom time to take in all the sights. This is truly a world-class dive that should not be missed. MV Alma Jane in Puerto Galera is a cargo vessel that was scuttled right in the middle of Sabang Bay in 2005 in an effort to create an artificial reef. Today it lies upright in 30 metres of water and is home to inquisitive schools of batfish, yellowtail fusiliers and drummers around the wreck. The hull is still intact and you can swim into it taking care of sharp edges and lurking lionfish waiting in the shadows for a meal to swim by. There is plenty to explore and you may also come across some smaller critters such as mantis shrimp and morays; stingrays can also be found in the sand around the wreck. Apo Island in Dumaguete has a few fantastic dives; amongst the best of them all is “Coconut”. This site offers excellent visibility and a fair current giving divers a good chance of seeing large schools of jacks. Turtles and sea snakes are also found here. The strong currents and the depth normally limit this site to advanced divers with experience in such conditions. Monad Shoal in Malapascua is a world famous dive site. This sunken coral plateau at around 20 metres is a well-known cleaning station for thresher sharks. These rare and graceful creatures can grow up to 6 meters in length and can be seen during the early hours of the morning. If you are lucky you might end up seeing threshers and manta rays on the same dive. 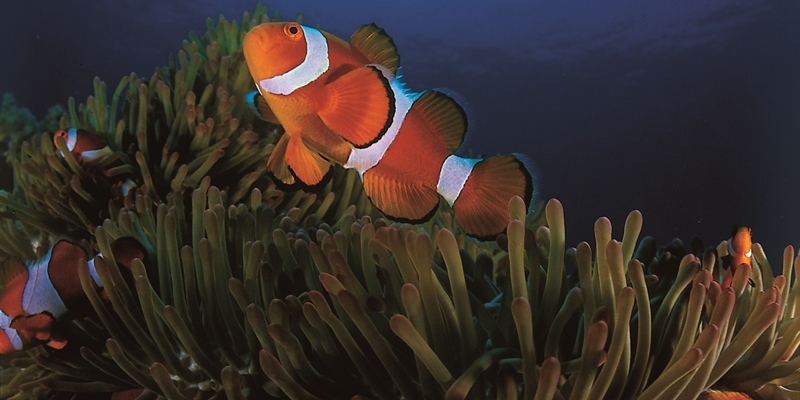 It is also a great location for underwater macro photography and for critter lovers! The conditions are generally pretty good with 15 metres visibility, however with a maximum depth of 24 metres and occasionally quite strong currents, advanced divers will fully enjoy this magnificent dive. It takes 30 minutes by boat to reach Monad Shoal from Malapascua Island and this site is best dived at dawn when you have more chances of seeing the threshers. Pescador Island in Moalboal is situated about 2km off the coast. It is a tiny island that you can get around in one shallow dive and offers the most diverse marine life of any site in Moalboal. There are superb drop-offs and overhangs all around. In actual fact, the whole circumference of the island is a wall dive. 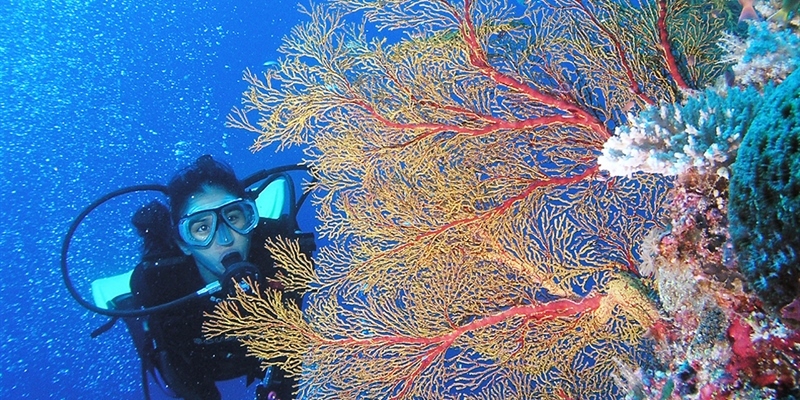 In the shallower areas coral formations are impressive and colourful. 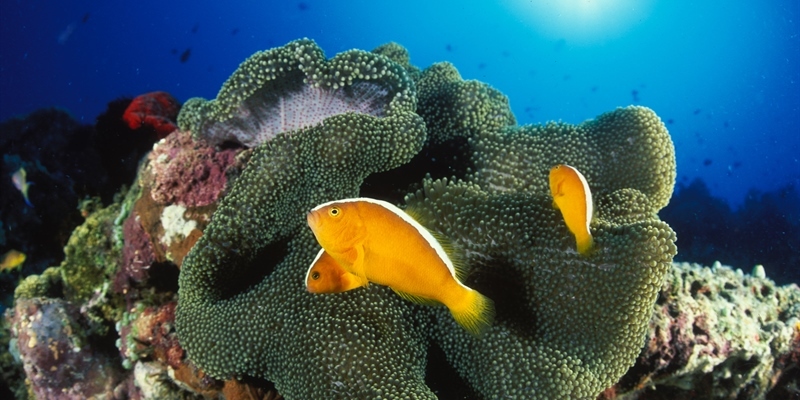 Further down, between 20 and 30 metres, soft coral is prolific. Look out for the “Cathedral”, a funnel shaped structure at 25 metres. When the sunlight hits this area, it is spectacular! Marine life includes snappers, groupers, lionfish and scorpion fish everywhere. At deeper depths you may encounter white-tip and hammerhead sharks. 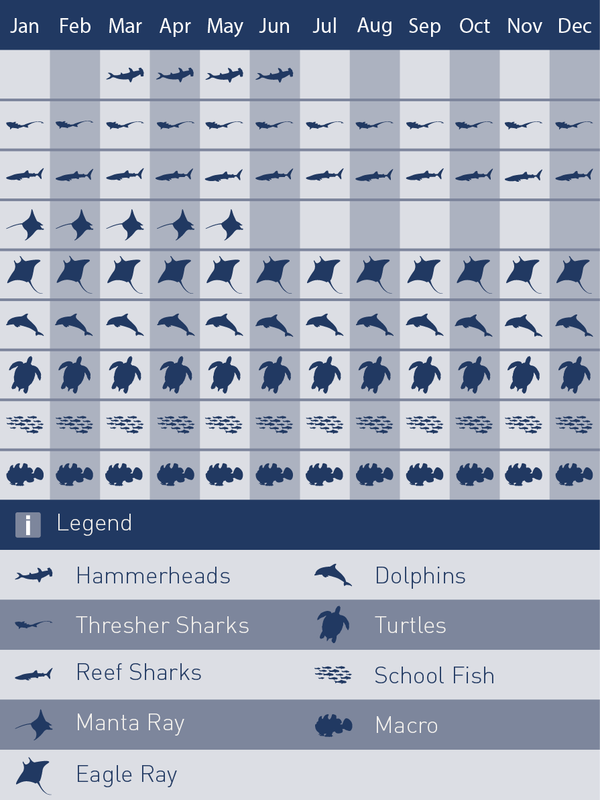 Very occasionally, tiger and thresher sharks also make an appearance. 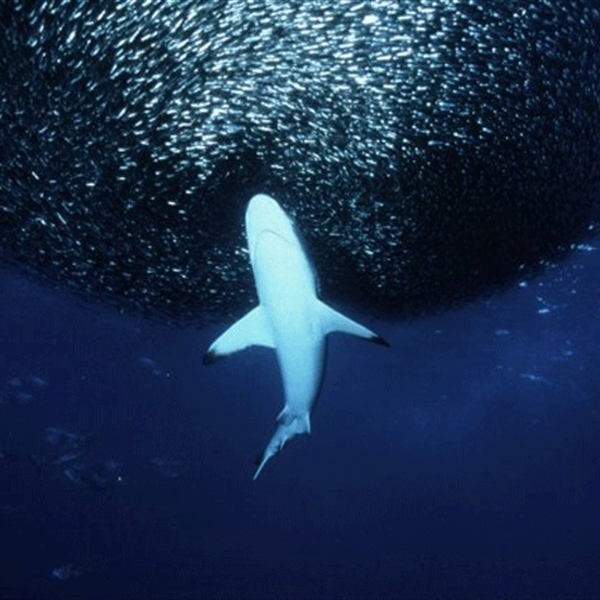 The island is also a fabulous night dive and an amazing encounter with massive sardine balls. Taiei Maru in Coron also known as “Okikawa Maru”, is an oil tanker resting upright in 27 metres of water. Largely in one piece it is over 180 metres long with the upper decks just 10 to 15 metres deep, a depth that allows you to spend a long time exploring the wreck, especially if you are diving with nitrox. Sometimes the wreck is paid a visit by very strong currents but this attracts large amounts of marine life. The wreck is home to schools of huge batfish as well as fusiliers, snappers and surgeonfish. Blue-finned jacks and mackeral often dart around hunting for food and on rare occasions you may even come across eagle rays and turtles. The decks are covered in hard and soft corals and for photographers there are scorpion fish, lionfish and nudibranchs everywhere. Shark Airport in Tubbataha is found on the north atoll and is one of the best places for spotting a variety of marine life including endangered sea turtles, white and black tip reef sharks and plenty of different corals. Tagbao Island in El Nido to the northwest point of Miniloc is a tiny island also known locally as the “Tres Marias” in reference to the three reefs that lie between the two islands. The reefs are shallow allowing for good snorkeling and beginner divers can expect to see lots of reef fish, colourful corals and painted crayfish. Confirm primary courses and boosters are up to date. Advised courses and boosters: Hepatitis A; Tetanus; Typhoid. Other vaccines to consider : Cholera; Diphtheria; Hepatitis B; Japanese Encephalitis; Rabies. Tipping in the Philippines is expected for many services. The standard amount is 10% of the total bill. Tipping is optional on bills that include a service charge, which is often 10% as well of the total bill. British Citizens do not require a visa for a stay of up 30 days. A 6 month valid passport and returned ticket is required. Under 14 hours on the direct flight with Philippine Airlines from Heathrow. Up to 11 hours to Hong Kong followed by 2 to 3 hours to the Philippines and up to 12 hours to Singapore followed by 4 hours to the Philippines. Flight schedules to Singapore and Hong Kong allow for same day connections. Hold Luggage: 20KG with Philippine Airlines, 30KG with Singapore Airlines and Cathay Pacific. Hand Luggage: 7KG with all airlines listed. Our packages include transfers on arrival and departure day. On arrival you will be met by one of our representatives and transferred to the resort. Please check the region fact file for transfer times. You can dive year-round in the Philippines but the dry season from November to May brings the warmest water and the best visibility. Between March and May it is very hot and dry with air temperatures ranging between 24 and 35 Degrees Celsius. The rainy season is from June to October although some islands such as Cebu, Bohol and Palawan are less affected. November to February are the cooler months with air temperatures ranging between 22 and 30 degrees Celsius. The water temperature in the Philippines is usually between 25 and 30 degrees Celsius making it the ideal conditions to dive with a recommended 3mm wetsuit. Stay 7 nights and pay for only 5 nights! Do you fancy diving in the Philippines? This is the perfect opportunity for you just have a look at this offer! Offer includes 7 nights stay in Magic Ocean. 7 days half board and 10 dive package. Offer valid within the month of October 2018. Transfers from & to Cebu airport can be arranged for a small surcharge. Offers can’t be combined with other offers. Stay 14 nights and pay for only 10 nights. Feeling like you need a last-minute holiday? We have just the perfect offer for you! Offer includes 14 nights stay in Magic Ocean. 14 days half board and 15 dive package. Offer valid within the month of October 2018. Get saving with this special offer! Special offer at Club Paradise! Call us today on 0208 655 6452 to claim this amazing discount. Save £150 when booking a full package with us! Call us today and get this promotion! Atmosphere Resort & Spa - Save £50 per booking! Call us today and get this promotion! Get saving £100 per booking! Save £100 per booking when booking with us! Call us today to save £100 when booking a full package to the Magic Island Dive Resort! Book a full package with Ultimate Diving and save £150 off your holiday! Special discount on Acacia Resort & Dive Centre. Book a full package with Ultimate Diving and save £110 off your holiday! Additional night with 2 dives – £125. Book by the 31/12/2018. Travel anytime in 2019. Room upgrade (subject to avilability) or spa traatment or Mitrox for the week. Book a full package with Ultimate Diving and save £100 off your holiday! Book the Atlantis Azores full charter from as little as £2799 per person including Flights on selected trips. Book 7 nights at the Atlantis Dumaguete with daily breakfast, airport transfers and 12 dives from as little as £1895 per person and get a Free room upgrade. Book 7 nights at the Atlantis Puerto Galera with daily breakfast, airport transfers and 12 dives from as little as £1895 per person and get Free NITROX.